It seems like every client I meet with or talk to lately wants to remodel their bathroom. As I consider each space and each client’s individual needs, sometimes, it is helpful to go to my Pinterest page and take a look at all of the photos that inspire me. Let’s take a look at some of my favorites. This is one of my all time favorites. I love the cool of the gray and white with the warmth of the antique brass. 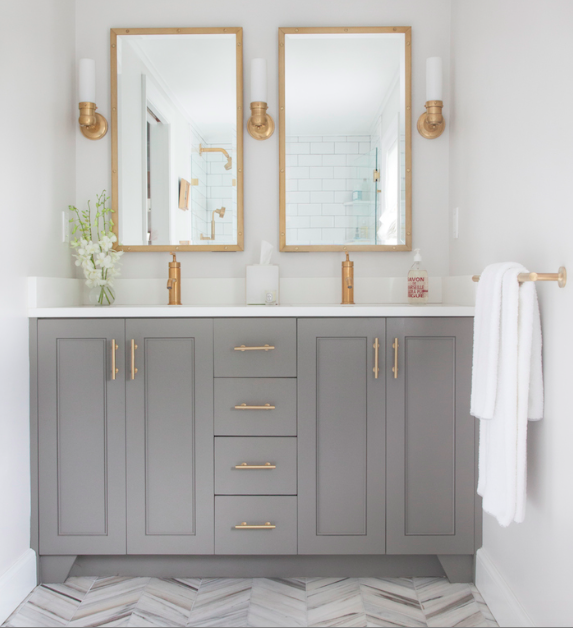 The herringbone floor adds just the right amount of graphic texture. 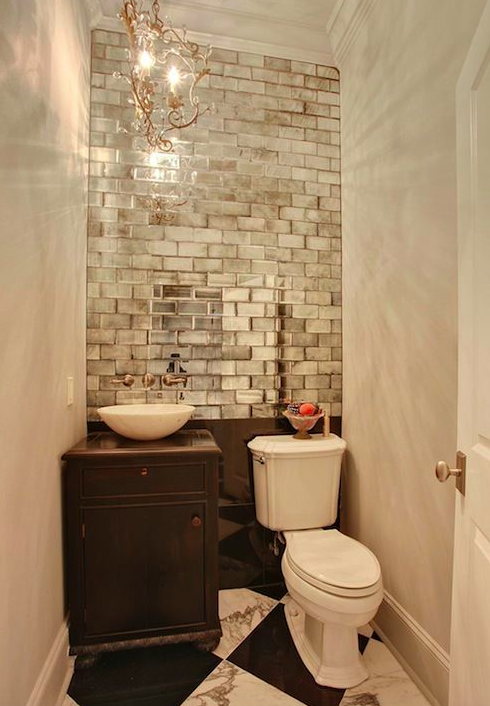 What I love about this bathroom is the unexpected addition of the mirrored tile. This is a 1/2 bath, so a completely functional mirror isn’t needed in this space. The addition of the mirrored tile makes this fairly ordinary bath look very special. We see a great deal of painted cabinetry these days. While there is nothing wrong with it, there is a place for other types of cabinetry as well. This stained custom vanity by Phoebe Howard is not only beautiful, but also timeless. It is the definition of classic design. If you were to see this bathroom in 20 years, it will be just as beautiful as today. The wood tones warm the gray marble. The fabric curtain softens the space. 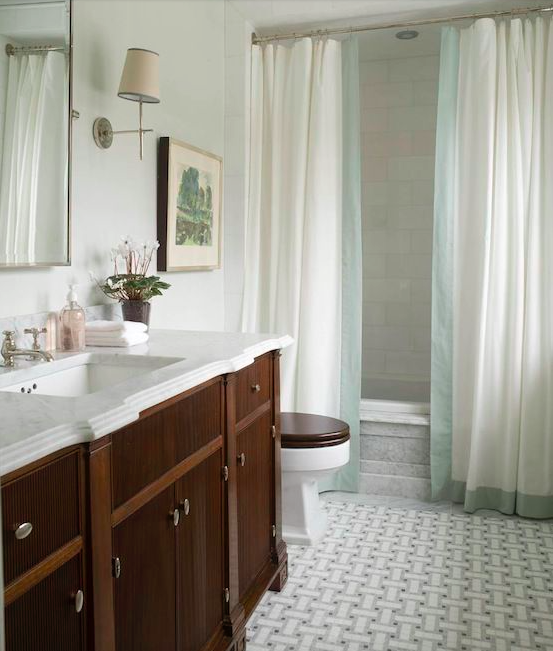 This bathroom by Sarah Richardson was one of my very first pins. 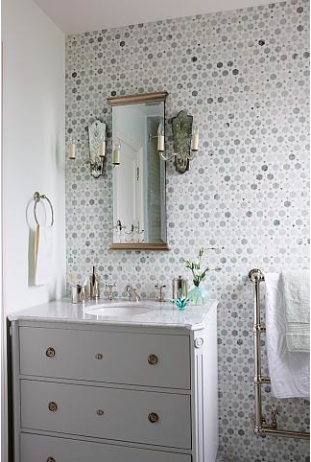 I love the wall of tile as well as the antique piece of furniture that was redesigned as the vanity. Again, a classic look that will stand the test of time. Each of these baths have classic elements that I feel are important in bathrooms. They are all very different from each other, though. When you decide to take on a remodeling project, reviewing multiple photos for inspiration is crucial to the design process. This allows you to create a design file that will show your designer, contractor or both what you like and what you don’t. This is the first thing that I ask my clients to do when we start working together. Once you settle on your design style, you can move forward knowing that you will be getting a space that looks, feels and functions well for everyone. My team and I would love to help you with your design project or bathroom remodel. Please feel free to contact us at info@lorimayinteriors.com.